That grand total has not been achieved without a lot of hard work and determination. When we were dating, Mary told me she regularly used to go to Crazy Mike’s video store, where there was a permanent wall display of Best Picture winners. She hadn’t been working through them systematically, but she had seen quite a few. Over the next few years, with the aid of Crazy Mike’s, the library, and Netflix, we have laid our eyes on almost all of them. The only one we haven’t seen? 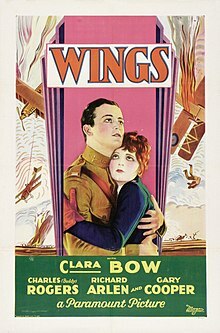 The very first one: Wings, the 1928 winner. We haven’t watched all those movies without coming up with a few lists. Below you’ll find my 10 favorites, 10 I was distinctly underwhelmed by, and 5 I didn’t know much about before I saw them, but am so glad I did. (Organized chronologically, because I just can’t decide which ones I like best). 1. All Quiet on the Western Front (1930). No wonder they hated this in Hitler’s Germany. It depicts war (World War I in particular) in distinctly unflattering terms. 2. Gone With the Wind (1939). I actually never saw this until after I had read the book. They’re both quite good. 3. Casablanca (1943). Justly popular after all these years. Such great dialogue. 4. The Sound of Music (1965). How can you not love the Von Trapps? 5. The Sting (1973). Paul Newman and Robert Redford in their primes. I particularly appreciated this one for the clever storytelling. 6. Chariots of Fire (1981). A little slow moving at times, but love the themes. 7. Gandhi (1982). A bit long, but what can you do with a biopic of somebody who lived to 78 and was active on the world stage until the end? 8. Amadeus (1984). A great story. A little bit trapped in the ’80s, but loved the music and themes. 9. Schindler’s List (1993). I actually haven’t seen this one since high school, but I had to include it. Very powerful. 10. Tie: Braveheart (1995) and Gladiator (2000). I like both of these for the same reason: they’re just fun and inspiring. 1. The Broadway Melody (1929). I could blame this movie on the movie industry still getting its wits about it. But All Quiet on the Western Front, which won the following year, is one of the best movies of all time—so that can’t be it. 2. You Can’t Take It With You (1938). I generally like Frank Capra movies (he also directed It’s a Wonderful Life), but I wasn’t into this one. I think the reason is that it relied too much on humor that must have been funnier in 1938 than it is today. 3. Going My Way (1944). It pains me to say this, since my brother is a huge fan of Bing Crosby. And I like Bing Crosby too. But for whatever reason, I didn’t like this movie. Give me the Road pictures with Bob Hope. Or White Christmas, for crying out loud. Just not this one. 4. An American in Paris (1951). I enjoyed most of the movie, but the eternal dance production at the end made it so it couldn’t finish fast enough. 5. The Greatest Show on Earth (1952). Very exciting if you have never been to a circus. If you, like most of the United States, have been to a circus, however, you may be left wondering why they spend so much time showing you entire trapeze routines. 6. Around the World in 80 Days (1956). What is it about the ’50s and subpar Best Picture winners? This movie had a lot of good scenes, but at the end of the movie that’s all I was left with: a lot of good scenes. Not a movie that was coherently good from beginning to end. 7. Tom Jones (1963). Never seen this one? I’ll save you two hours of your life: picture Albert Finney, mugging at the camera, for an entire movie. Yawn. And this was billed as an “adventure” comedy. 8. Oliver! (1968) Sure, it has some good moments, and a few nice songs. But at 2.5 hours, it overstays its welcome. 9. Ordinary People (1980). Watching this movie was depressing. Not because it was sad—because I was afraid it would never end. 10. The English Patient (1996). I remember seeing this movie in the theater when it came out. Know what I remember? The first scene. And how long it was. That’s it. 1. The Life of Emile Zola (1937). Not a movie that usually gets mentioned when you hear about “classics.” But I like historical dramas, and this was a pretty good one. 2. The Lost Weekend (1945). A sober (get it?!) look at the corrosive effects of alcohol addiction. I didn’t expect a movie from the ’40s to be this brutally honest. 3. The Best Years of Our Lives (1946). A film about the lives of three U.S. servicemen after they come back from World War II. An unvarnished look at an experience many people of my grandparents’ generation went through. 4. The Godfather (1972). This one makes the “surprise” list because I usually don’t care for most crime movies, or movies where there is much violence. But it was hard to not like this one. I also liked The Godfather Part II. 5. Million Dollar Baby (2004). Again, I liked this one even though it is in a genre (boxing dramas) I don’t usually enjoy. Where is the dislike button? Underwhelmed by Going My Way, it basically created the idea of a cool Catholic priest character. Incidentally, I think the sequel The Bells of St Mary’s is actually better and Going My Way does drag at times. Yes, the plot does drag at times. And it didn’t necessarily help that the title song is so lugubrious. It’s not terrible, but there are better Bing movies, and better movies with priests in them, like On the Waterfront. I haven’t seen The Bells of St Mary’s; I’ll have to check it out. The title song isn’t the best. That is why the music executives buy Swinging on a Star instead. Swinging on a Star won the oscar that year for best original song so it is on the same list as It’s Hard out Here for a Pimp and Lose Yourself which is appropriate.